Titan Quest calls itself an “action role-playing game” that is “set in the mythical worlds of ancient Greece, Egypt, and Asia”, and while Titan Quest certainly is an action game, in that you’ll need to hack and slash your way through those ancient worlds with little relief, Titan Quest really doesn’t provide much in the way of role-playing. 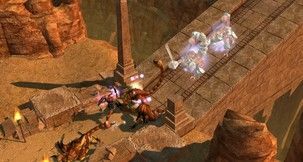 What Titan Quest does give you is a game that looks nice, plays well, and has immense opportunities both for replaying, and for making your own worlds. 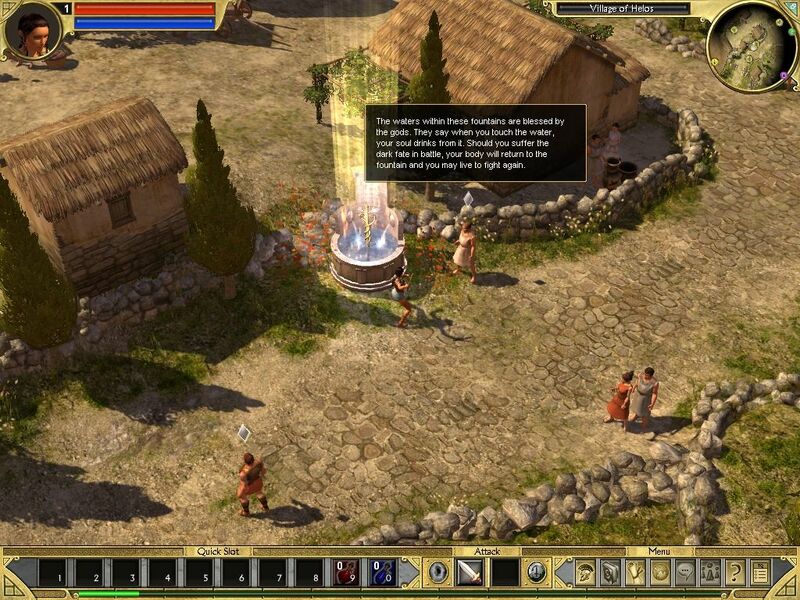 Titan Quest starts with you playing a wandering warrior who has appeared at a time when ancient Greece is in an uproar. You’re thrown immediately into the thick of the action by the first person you meet at the side of the road – a man from a local village requesting help. As you run down the road, you’ll start to notice the attractive graphics, the first thing that will impress you in the game. Both your character, and everything else around them, cast some visually impressive shadows, even down to the weapons they are carrying. The trees, while they don’t actually move, look lovely, and the grass and water do move as you run through them. Titan Quest also does a nice job of making it possible to see through any scenery your character stands behind, although this doesn’t always quite work especially when inside or underground. While you’ll only get a glimpse of the scale of the scenery at first, as you play through the game you’ll definitely get an idea of how much effort went into just the graphics, and how spectacular they can be at times. This is particularly true if you ever get to look down from a cliff at the next area you’ll be heading towards. Moving on from graphics, one thing that isn’t terribly notable in Titan Quest is thematic music. 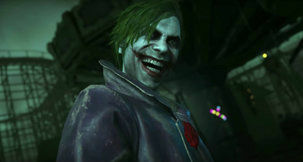 While there are definitely occasions in which the music is very stirring, there are large portions of the game in which the music simply fades into the background. In many ways this helps to make many outdoor areas, as this is where that often occurs, fairly bland in the way they feel. The areas which provide the best ambience are those which are underground, as the darkened nature of the environment coupled with the more prevalent thematic music just seems to work together that much better. That’s not to say being outside is drab, because as in-game time progresses, the sun will gradually move through the sky and eventually become night. Some of the most beautiful effects are during sunrise and sunset, when all the scenery seems to take on a gorgeous glowing hue. Unfortunately while pretty, this doesn’t make those areas seem anything but normal, which seems contrary to what you’d expect for woods and hillsides that are filled with rampaging monsters. 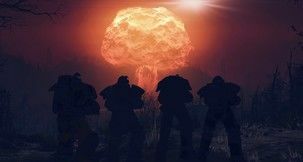 You won’t have been playing the game for long before you run into something you’ll be seeing a lot for the rest of the game – large groups of monsters of the same type. From the beginning of Titan Quest through to the end, these guys always seem to hang out in groups. And while that isn’t necessarily overly challenging for your character, it can get very tedious at times. 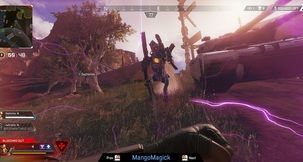 As you start fighting your way through these groups of monsters, you’ll come across another main aspect of the gameplay – loot. A very nice aspect of Titan Quest is that if you fight a bunch of guys with swords, you’ll be able to pick up those swords once the fight is complete so you can sell them later on. Most of that time that group of guys will also have a treasure chest, pile of bones, coffer, or . . . you get the idea, in which they have stored some more valuable items. This is great, because if some larger than average dude has a fiery hammer or the like, you’ll get to pick it up. The downside is that even as you get towards the end of the game, you’ll end up with a lot of junk on the ground. In order to help you sort out the good stuff from the dross, you can hold down the ALT key, which will show you the items of higher value. 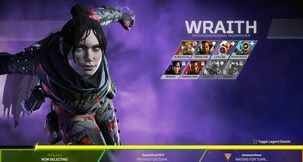 Item names will be shown in different colours depending on whether they are broken, standard, magical, rare, epic, or legendary. Gold, potions, and relics that can be used to enchant items, will be different again. All this will help you sort things out pretty readily, but it’s still a disappointment to take down a group of monsters and only be rewarded with items fit only for a scrap heap or a low level character, which unfortunately happens a lot even at the later stages of the game. 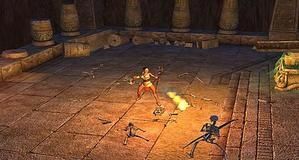 Around the time that you complete your first quest in the game, you will hit one of the highlights of Titan Quest – the Skills Mastery. Titan Quest provides eight different masteries, of which your character can choose two. The masteries are Spirit, which is similar to necromancy, Rogue, Hunting, for those who like bows and arrows, Storm, for ice and lightening attacks, Warfare, Nature, Defense, and Earth, for those of us who like to fire off large balls of flame. Within each mastery, there are around twenty separate skills on which skill points can be spent. Most of these skills have different levels to them, so that the Flame Surge skill in Earth will cause a certain amount of damage if you spend one skill point, and more damage if you spend two. For each level a character advances, they will gain three skill points, and after level eight is reached a second mastery can be chosen. Unfortunately, you still only get three skill points per level, so it can be a difficult choice as to where they are spent. Not only does this make it possible for your game experience to be very different each time you play the game, but it means that even if you and your friends chose the same initial mastery, the actual way the character plays could be very different. 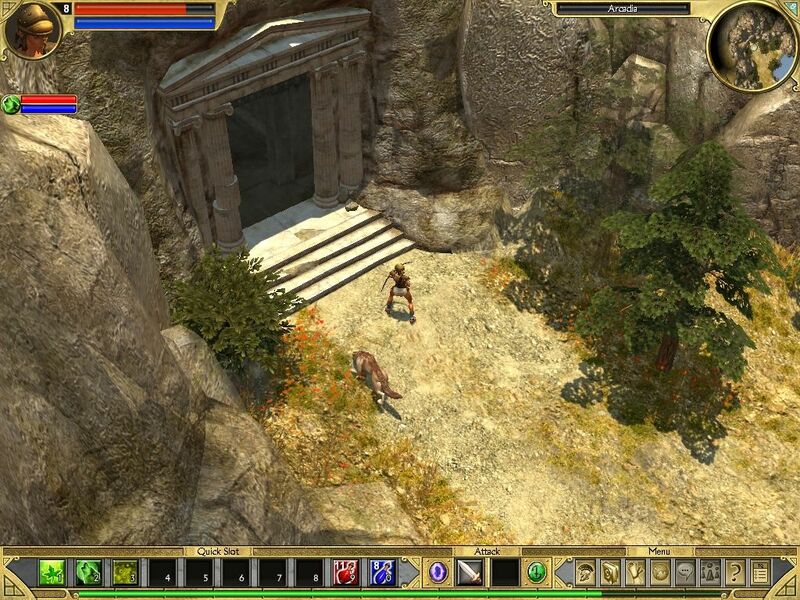 As you continue to play through Titan Quest, you’ll notice that the game is simply massive. Even if all you do is follow the main path through each area of the game, there are still at least seven major points on the main quest in each of Greece, Egypt, and Asia, and those aren’t all that close together. If you stop to investigate all of the side quests, for which you’ll generally get a small magical item or some experience points, there are literally dozens and dozens of hours of game play. It took this reviewer over 20 hours just to complete the Greece portion of the game, with Egypt and Asia being similarly sized. However, unlike another highly popular RPG that’s currently available, it’s not just a matter of exploring and coming across things. You are basically channeled through the game, in some ways similarly to many first person shooters. While there isn’t necessarily a direct path to take to the next area, there is usually a specific entrance and exit point through which your character will need to pass. This basically allows you to either follow the road, or wander to the sides and do some extra killing. However, you may not want to proceed as quickly as possible because you may find that your character simply isn’t up to battling some of the larger monsters without picking up the extra experience that the side quests and exploration provide. The main plot of the game is for your character to solve the reasons behind the plagues of monsters that are terrorizing the ancient world. To guide you on your quest, you’ll meet several characters who will help keep you going in the right direction – though sometimes they’ll want you to do something before they will help you. So while this is role-playing in the sense that you can gather and complete quests, it isn’t true role-playing because you don’t get a choice of how your character will respond, or even how they will complete the quest, for example in a “good” or “evil” way. You just get the quest and then have to go and do it. As you work on completing your quests, your character is likely to suffer some setbacks along the way – see the image about making friends above. And while you can, if played judiciously, manage to get through most things without dying, there is no doubt that it’s going to happen at some point. If and when you do, what will happen is that your character, along with all the equipment that they were carrying, will be taken back to the currently active Rebirth Fountain. These will appear at regular intervals throughout the game, so it will be important to make sure you activate them, or it can be a long walk back to where you fought your last battle. The only penalty for being “reborn” is a small deduction in experience, though your character can never lose a level they have gained. The higher the level of your character, the greater the experience deduction will be, so the idea is to try and stay alive. The only problem with this system is that when you exit the game, you come back not to your location when the game was saved, but to a rebirth fountain. This can be quite frustrating until you learn that you need to exit when you reach one, somewhat like completing a checkpoint in other games. Another frustrating thing with loading a saved game is that a lot of areas will be repopulated with monsters. They won’t all be back, but a good many will. So don’t clear out an area and then save and exit. Make sure you press on to the next rebirth fountain before saving. This is where you'll end up after you die. People giving you quests sometimes make them a little hard to understand. 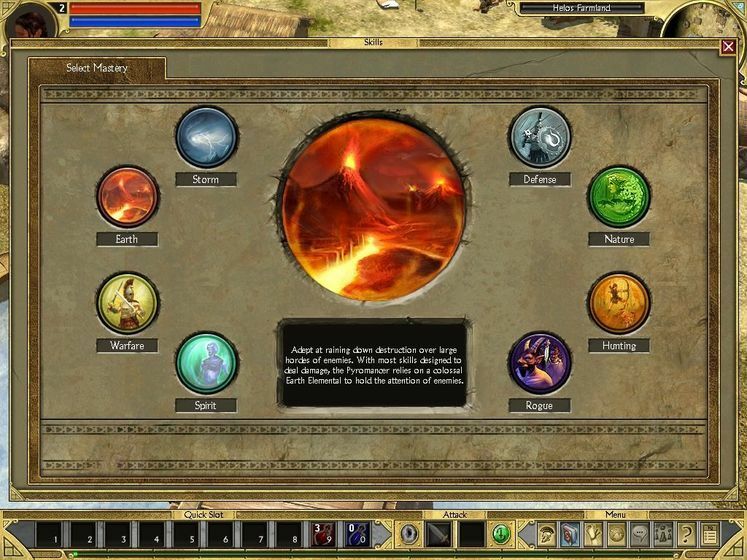 Given the size of Titan Quest, you’ll need a way to move around fairly quickly. This is accomplished through Portals, which appear at each point along the main quest path. While not terribly useful in that your character is unlikely to want to go back to the beginning of the game to sell their latest loot, this provides a functionality equivalent to the “town portal” from Diablo. At any time in the game, you can open your own individual portal, and journey through this to a major portal, near which there is always a merchant of some kind. There are three types of merchant in Titan Quest – traders, blacksmiths, and arcanists. The first are generalists, while blacksmiths specialize in items for warfare, rogue, and hunting masteries. Arcanists are obviously for those of the magical persuasion. A problem with getting your loot to merchants is the carrying system. It’s almost identical to that in Diablo, which means you’ll likely end up doing quite a bit of shuffling to fit everything in. As Titan Quest progresses, you will be awarded additional backpacks, and these certainly alleviate the situation, but your visits back to merchants to “unload” will be pretty regular. 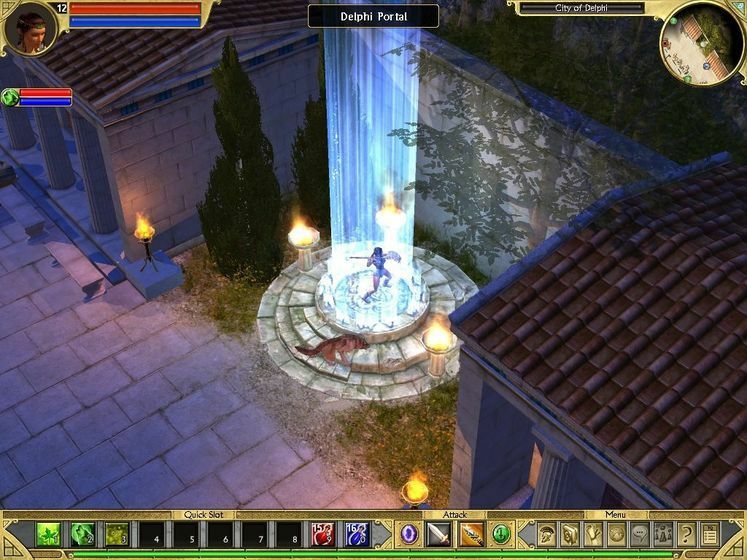 There is a lot more to Titan Quest than what is described here. The game provides a good multiplayer experience, although from comments in various discussion forums it seems that Iron Lore still have a few kinks to resolve in this area. Many of the skills that your character uses will benefit allies nearby, which is a feature obviously directly aimed at multiplayer groups. 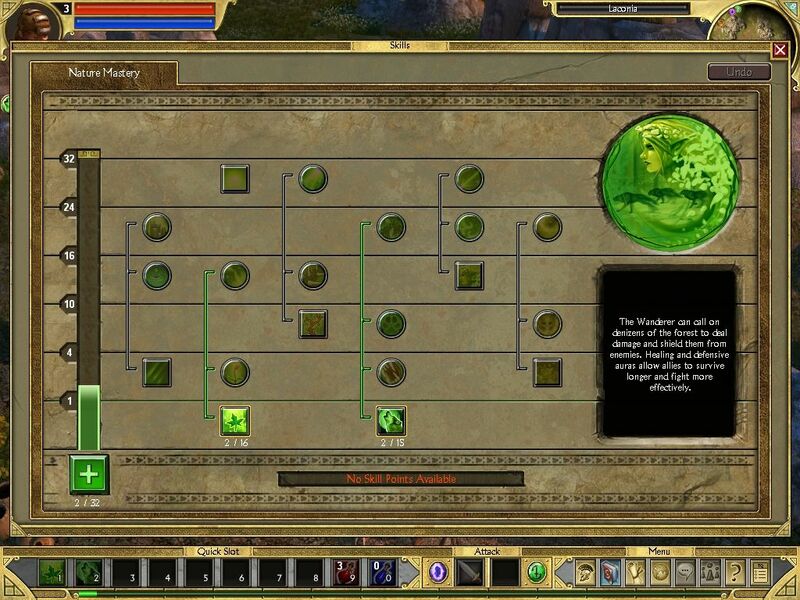 Titan Quest also comes with an incredibly comprehensive toolset for creating new artwork, quests, and entire map levels, which will no doubt be a boon to anyone looking to mod the game. Titan Quest also does a great job on level loading, what with there being practically no delay when moving from one area to the next. There is certainly no “loading” box that is so common in other games. The frame rate in the game sometimes isn’t all that good, especially when there are multiple monsters on the screen, but on a recommended system I had no problems. Overall I did find Titan Quest to be an enjoyable experience, but then I guess I like killing pixels. Portals are a quick way of getting from place to place This is going to hurt! Basically what it boils down to for Titan Quest is that if you like a hack and slash game in the style of Diablo, then you’ll definitely enjoy Titan Quest. If, on the other hand, you’re looking for a true role-playing experience in which bashing things with a sword, spear, axe, bow, or some other weapon isn’t the only way to achieve your goal, you’re probably better off playing Oblivion or waiting for Neverwinter Nights II. Finally taking down that enormous level boss who has been making your life miserable for the last several minutes, or longer, and claiming the boat load of loot they leave behind. Then wading through the next group of low level monsters like they were chaff.